. Published on Wednesday, March 21, 2018 . Our #RechargeCPP campaign is in full swing, and Broncos are continually reinventing, redefining and recharging while using the amenities that the Bronco Recreation and Intramural Complex (BRIC, Bldg. 42) has to offer. This winter quarter, we have focused in on how one student has redefined himself, the world around him and his objectives while utilizing the BRIC. 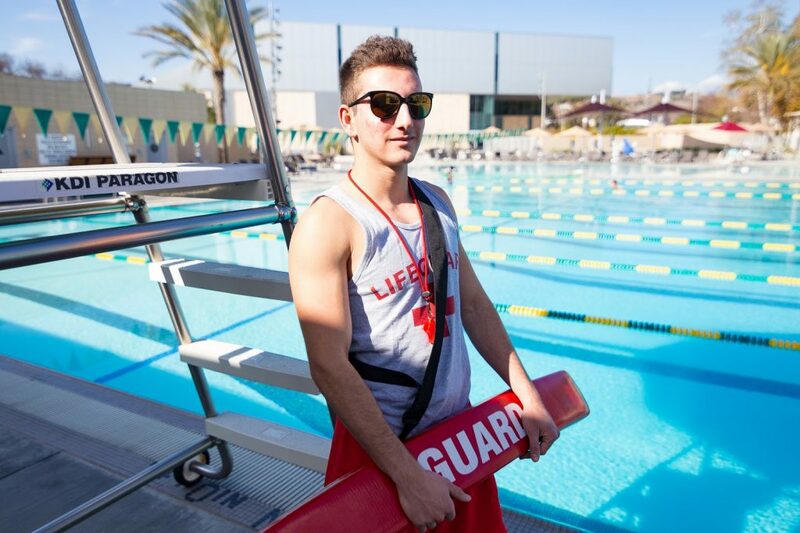 Tade Aghakian is a second-year electrical engineering student and works as a lifeguard and an Intramural Sports official for ASI Campus Recreation. We had the chance to speak with him about his experiences using the BRIC and how his fitness objectives have been redefined this quarter. Image of Tade Aghakian standing next to of the BRIC pool in his lifeguard uniform. Aghakian has dabbled in many of the BRIC’s facilities. He often swims at the BRIC pool, climbs the BRIC’s Bronco Peak and plays Intramural Sports each quarter. Aghakian’s college experience has been redefined greatly by his involvement at the BRIC. Image of Aghakian and a fellow lifeguard demonstrating CPR on a Manikin by the BRIC pool. Image of Aghakian on the lifeguard stand overlooking the BRIC pool. Aghakian has redefined himself as an athlete and as a student by taking full advantage of what the BRIC offers members. He has also redefined how he views success. Image of Aghakian from behind in his lifeguard uniform overlooking the BRIC pool. For our final installment of the #RechargeCPP campaign, this spring quarter, we are shifting our focus on to how students have utilized the BRIC to recharge in the midst of their busy lives. With that being said, we want to hear how you recharge at the BRIC! Share with us using #RechargeCPP, and you could be featured in next quarter’s newsletter or on Campus Rec’s Twitter, Facebook and Instagram!